In yet another major hit to the already dwindling customer base that Research in Motion (RIM) has acquired over the years through its Blackberry line, the government agency, Immigration and Customs Enforcement agency (ICE) is switching over to iPhones. Their stated reason is that the iPhone currently provides a better technological experience for its users. ICE has used Blackerry devices for eight years now and felt that RIM has not advanced fast enough for their needs. I have often stated that the last saving grace for RIM was going to be its government contracts and it appears that this is becoming the case. 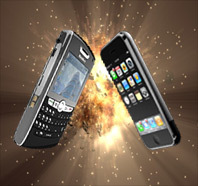 In comparison, Blackberry has always been the favored device for many large corporations and government agencies because of its ability to be locked down almost completely by IT and security managers through the use of the Blackberry Enterprise server where as iPhones and Android devices only offer limited control. As for the battle between iPhone and Android devices, ICE said that it looked at both options and decided that iPhone was still a better choice because of the tight controls Apple has on its iOS software. Of course this development will no doubt give iPhone fans more steam for there “who’s phone is better” argument, but I feel that it only goes to prove that iPhone is indeed more of a tightly controlled device whereas Android devices allow more user customization and “hacks” to get things just right. As a result of this change, ICE claims it will be providing phones to 17,600 employees which will equate to just over $2 million in sales for Apple. RIM is understandably disappointed in their decision especially since BB10 is about to come out in March of 2013. RIM states that the BB10 will offer a brand new operating system among other features re-directing their focus on getting back the customers they’ve been losing for over a year now. Personally, I feel like RIM is done. They’ll go the way of Nextel and if their lucky, maybe they’ll be bought out too. It’s not that I want to see RIM fold…it’s just that I quit being a Blackberry customer when I bought the first iPhone and now that everyone is catching on to the smartphone craze, I can’t fathom how Blackberry can compete anymore. However, I might be speaking prematurely because with my luck, the BB10 will be a real contender and a new turning point in the smartphone game will have arrived.